6 CV myths – fact or fiction? You are here: Home / Careers advice / 6 CV myths – fact or fiction? If you’re looking for help online on how to write the perfect CV, then you’re not alone. Millions of people worldwide logon every single day to search for the best tips and secrets to writing a CV that ‘stands out’, and with so much information available it’s easy to understand why. Fiction: If someone tells you that you only need to write one CV which can be used to apply for numerous different positions – they are wrong! This kind of advice is pure fiction and will leave you at a huge disadvantage over other applicants. Fact: Every role you apply for should have a tailored CV which specifically addresses the needs of the employer. It doesn’t matter how similar each of the roles are, you should always tailor your CV to the job and ensure it covers exactly what they are looking for, and allows the most recent and relevant information to the forefront. This will make it easier for the hiring manager to see that you are the right person for the job. Top tip: Research the company to find out who their customers are and what product or service they provide. What are the company’s goals and how do they aim to achieve them? What can you bring to the role that can help them achieve their targets/goals? Using this research you should aim to tailor your CV to the role, the company and the industry. Use the correct industry jargon and ensure your CV oozes all the right keywords and phrases. You want the employer to instantly recognise that you’ve gone to the trouble of not only reading the job advert, but also investigating the company further to show you passion and dedication to the position. Fiction: This just isn’t true, and although your CV may be run through some software to narrow down potential candidates, your application WILL be read by a real person – if of course you use the right keywords so the software allocates you to the ‘potential’ pile! Fact: Not that many employers use specialised software to filter in or out applications, and although you should always use the relevant keywords in your CV, it’s also important to realise that you shouldn’t overdo it as the hiring manager will be taking the time to read it in person. It isn’t possible for a machine to decide who gets to have an interview, and will only be used to help narrow down the search. Top tip: The hiring manager will only spend on average around 8.8 seconds skim reading each CV before they decide upon potential candidates. Using the right keywords and jargon from the job advert as well as your own industry knowledge, will put you at an advantage over other candidates who haven’t taken the time to be as passionate and dedicated about the job as you. Fiction: Contrary to popular belief, you don’t actually need to provide your hobbies on your CV. An employer is mainly interested in your skills, education and experience and isn’t always too concerned about what you get up to on a weekend. Fact: If your hobbies are not particularly very interesting – going to the cinema, reading a novel, or socialising on the weekend – then you should probably not bother with the hobbies section on your CV. An employer would take absolutely nothing from knowing this information, and it wouldn’t add any value to your application. Top tip: There are some instances when you can take advantage of the hobbies and interests section and add a lot of value and credibility to your CV. Sporty, creative, and charitable hobbies are always a great way to show additional skills without having to spell it out to the employer. Being captain of a rugby team, playing in a band, or giving up your free time on the weekends to help out at your local country park will make for great reading. These are the types of interests that an employer would take notice of, and it would give them a better understanding of your character and personality (plus sporty activities show you take an interest in your personal health = less sick days). Your extracurricular activities can show off many soft skills – leadership, communication, project management, hard working, team working, creativity, and so on. Fiction: An employer does not want to see every job you’ve ever worked at and everything you’ve ever achieved in life – either work or leisure. Unless you can directly link everything to the role and it’s relevant, then it needs to either take a back seat or be completely omitted from your CV. 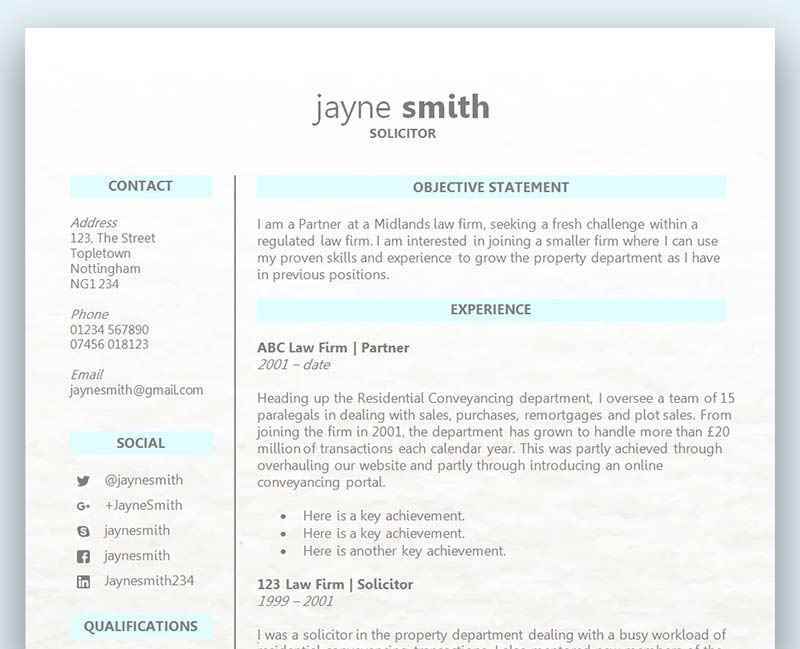 Fact: The hiring manager will quickly read each CV to see who has the right work experience, skills and qualifications. If they have to read through endless daily tasks and responsibilities for each role that don’t have a great deal of relevance to the position, then your CV is likely to end up in the trash. Top tip: Your CV should look to address the most important aspects that an employer would want to see on a CV, and shouldn’t contain your life story. If you have an extensive employment history it would be wise to look back over everything and decide upon which is the most relevant to the employer. Typically your most recent roles will not only be relevant but more in keeping with the kind of timeline the hiring manager is going to want to read. Be careful not to have any employment gaps, and instead consider keeping the information down to a minimum with a job title, company name, and brief description of what the job entailed. Fiction: Even just the one spelling mistake could see your CV thrown into the bin, and although you didn’t think it would matter too much if it wasn’t perfect, you’d be very wrong. Any kind of obvious error in formatting, presentation, font style/size, and spacing will likely see your chances of an interview go up in smoke. Fact: An employer will expect perfection, and with so many other candidates providing perfectly executed CVs, why would they need to choose you? The slightest mistake on your CV shows sloppiness and a lack of care, which could easily transfer over to the role if you were to be hired. The employer is looking for diligent and dedicated candidates who present an error free CV, and anything else below that standard just isn’t worth the paper it’s written on. Top tip: To help ensure your CV is free of errors and to get a critique of your presentation and content, consider asking someone you know to proofread and quality check your CV before you send it off. Ideally, you should be asking a manager who has experience in hiring and reading lots of CVs that can offer some great advice on yours and point out any errors. Not only will this give you a better guarantee that there are no silly mistakes, you could also receive some great advice which allows you to edit and make further improvements. Fiction: Not every role requires a degree, and if you look much closer at the job advert you should be able to find out exactly what the minimum requirements are. Don’t be put off from searching through particular jobs that you like, and don’t assume that without a degree or a strong education that you shouldn’t even apply. Fact: You may find that certain roles require a minimum amount of qualifications – this could be a degree or specific GCSE or A-level grades. However, not every job advert will make education a mandatory aspect of the application, and you may be surprised at how many employers put experience above a university degree. Top tip: Be sure to check that the job does or doesn’t require a qualification before you apply. You don’t want to waste yours and the employer’s time when you could spend that time looking for something more suitable, or considering gaining the relevant qualification if this is your dream job. Without a degree you should be looking to gain valuable work experience as quickly as possible, starting with an entry level position and working your way up the ladder. Hard work and graft can sometimes be seen as more important than hiring someone fresh out of university, and the soft skills you gain can have an advantage over someone with little to no work experience. If however you are finding that your desired career path requires a certain qualification, then don’t hesitate to put plans into motion and find out what you need to do and where you need to study. After a few years you could regret being in a job you don’t like, and wondering how different your career could have been if you’d have taken the plunge at the start and gotten the qualifications you needed. Should you apply for a job if you’re underqualified? Could technology replace the CV?